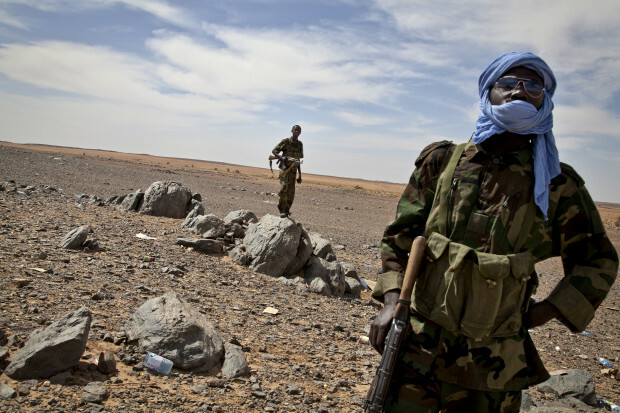 Chadian troops on patrol in northern Mali (UN Photo/Marco Dormino). The launch of Operation Barkhane across the Sahel last month marked a significant shift in France’s relationship with the region and its attitude to counter-terrorism. French strategy has now demonstrably shifted from previous attempts to scale-down its presence in countries such as Chad and Mali. The new military strategy is a conscious re-engagement and appears to show that France envisages a military victory against the constantly morphing Islamist threat. The decision to base the operation in the Chadian capital N’Djamena is also interesting, given Chad’s geographical position, which is considerably east of what is generally seen as the epicentre of the Al-Qaeda in the Islamic Maghreb (AQIM) jihadist threat in northern Mali and northern Niger and southern Algeria. It also suggests that assets deployed under Barkhane will also be used to help combat the threat posed by the Nigerian islamist group Boko Haram, which has been steadily expanding its activities beyond the borders of north-east Nigeria. There seem to be two main reasons for basing Barkhane in Chad. First, the country has a decent military infrastructure, including a current French base at N’Djamena airport. “˜Operation Epervier’ was established in Chad in the late 1980s at the end of the Chadian/Libyan war; it comprised around 800 French troops in N’Djamena and a smaller contingent in Abeche to the east and Faya-Largeau in the north. Epervier – which has now been absorbed into Barkhane – also had a number of Mirage jets and Breguet reconnaissance craft stationed at the airport, which were used in the mid-2000s to provide the Chadian authorities with aerial surveillance on two serious rebel attacks advancing from the east. The second reason seems to be political – to acknowledge the role the Chadian armed forces (the ANT) played in supporting France’s battle against AQIM and its splinter Islamist movements in northern Mali. With barely a moment’s hesitation, Chad sent 2000 troops to support Operation Serval in early 2013. The Chadian troops, well-practised in desert warfare after their efforts to stabilise the country’s remote eastern region during the Darfur crisis, provided essential support to France and had a number of important successes, including killing one of the top Al-Qaeda commanders, Abou Zeid. More than 30 Chadian soldiers died in the operation. The fact that French president Francois Hollande chose to visit Chad and not Mali on his July visit to the Sahel speaks volumes about the two countries’ relationship. “France is now repaying its political debt, and Idriss Deby has re-enforced Chad’s position as a strategic and reliable partner against Islamist terror” says Sergei Boeke, a Research Fellow at the International Centre for Counter-Terrorism. Operation Barkhane is essentially a re-organisation of France’s forces across West Africa, rather than a significant new deployment. It will total about 3000 military personnel across five new and expanded bases – Chad (under French General Palasset), Mali, Niger, Burkina Faso and Mauritania. They will be equipped with six Rafale Mirage jets, 2000 armoured vehicles, ten transport aircraft and three drones. Some questions remain about Barkhane’s location so far from the main centre of operations in Mali. However, a French military presence will be maintained in the country and a new airstrip is under construction in the northern city of Tessalit. There are definite advantages to Chad’s position in central Africa – many analysts believe for example that a core of AQIM fighters are now taking advantage of the almost complete anarchy playing out between rival militias in Tripoli to establish rear bases in the southern Libyan desert (an area which can be more closely monitored by French surveillance planes operating out of Faya-Largeau in Chad’s extreme north.) But there are some logistical disadvantages in terms of longer flight times for surveillance drones being sent out from Chad. Although there have been many attempts over the years to argue that Chad itself is threatened by AQIM, this has never materialised. Some of the distance problems can be countered by stepping up the use of information from the US drones base established in the Nigerien capital Niamey. France has already said it will deploy 300 intelligence specialists to Niger. One particular area of concern is how Boko Haram will react to the increased French presence in Chad, coupled with the US decision to station 80 personnel in N’Djamena to assist with the search for the 200 Nigerian schoolgirls taken hostage by the group in April. Boko Haram have struck in neighbouring Cameroon several times in the last few months, including most seriously for Chad at gendarmerie posts in the town of Kousseri, just a few kilometres from the Chadian border and the capital city. In June, RFI ran a story about an audio recording purported to be from Boko Haram directly threatening Chadian territory in an apparent response to the government’s support of regional counter-terrorism operations. This is a long-standing fear in Chad – particularly as the four-way border between north-eastern Nigeria, Niger, Cameroon and Chad has today become poorly defined due to the shrinking of Lake Chad. Although publicly the region’s leaders have stuck together in the face of Boko Haram – launching a new regional border patrol force in August 2014 – privately some of the governments have expressed frustration at Nigeria’s, and to a lesser extent Cameroon’s, apparent inability to effectively combat the insurgency. There is a danger that France’s counter-terrorism initiatives against groups like AQIM could be de-railed by this. “Boko Haram could be extinguished in a heartbeat if Nigeria took the problem seriously” one senior Sahel foreign ministry official told me in July, “AQIM is the real strategic threat that we mustn’t lose sight of, but it seems like now everyone wants to concentrate on Boko Haram”. France’s decision to base Barkhane in N’Djamena shows that it is facing up to the multiplicity of the threat across the whole Sahel region; “While Chad is far from Mali (comparatively) basing in Chad allows France to spread out its forces in the way they deem necessary for operations in the Sahel” says Andrew Lebovich, a former consultant on the Sahel for the Open Society Institute West Africa. But strategists must ensure that the goal to “regionalise” counter-terrorism efforts across the whole Sahel does not become an overwhelming one.